The retreat includes a combination of 4 hours of yoga, meditation, mindfulness activities all with you as the parent in mind! Maria Sanders, LSW and PCI Parent Coach® and Jennifer Brown, former guidance counselor, founder and facilitator of The 1 For All Project invite you to learn about important tools when it comes to communicating and connecting with your tween boys.Together we can empower our boys to navigate their changing worlds and discover their place in it. 3 weeks, 3 topics! Wednesdays 7pm-9pm April 3, 10 and 17th. Screen Time: Let’s talk about the digital life and let’s learn how to create a plan! Join our workshop "The Digital Life with Teens” with Maria Sanders Parent Coach. DISCOUNTED RATE AVAILABLE FOR MLC members. Contact Linda Palatini for registration details. Ready for a change to your diet mentality so that you can be a better role model for your children? Have you ever thought "how can I make sure my child doesn't grow up with the same challenges around food that I have"? 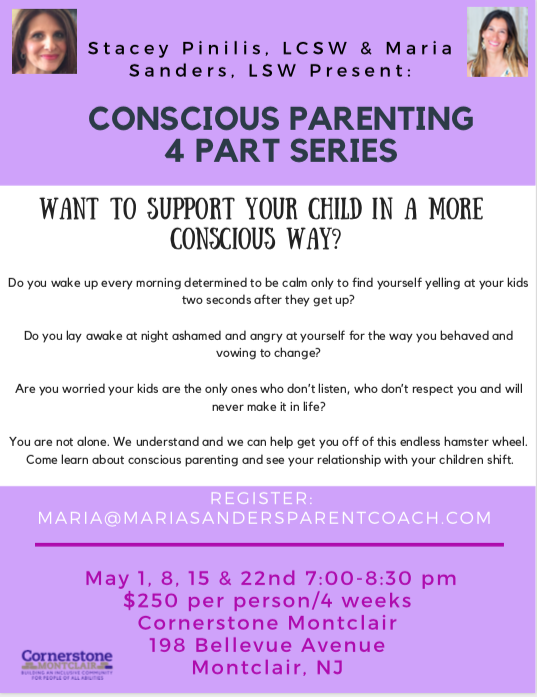 The course, based on the best selling book, The Conscious Parent, by Dr. Shefali Tsabary, will take you on an amazing journey of self-discovery and parenting transformation. Maria Sanders coaching invites parents of young children who have recently been diagnosed with special needs for A Special Morning. This group will provide a safe and welcoming place in which parents can meet to share similar experiences, give advice and support and discuss topics of interest. Do you wish to support your child(ren) in a more conscious manner? 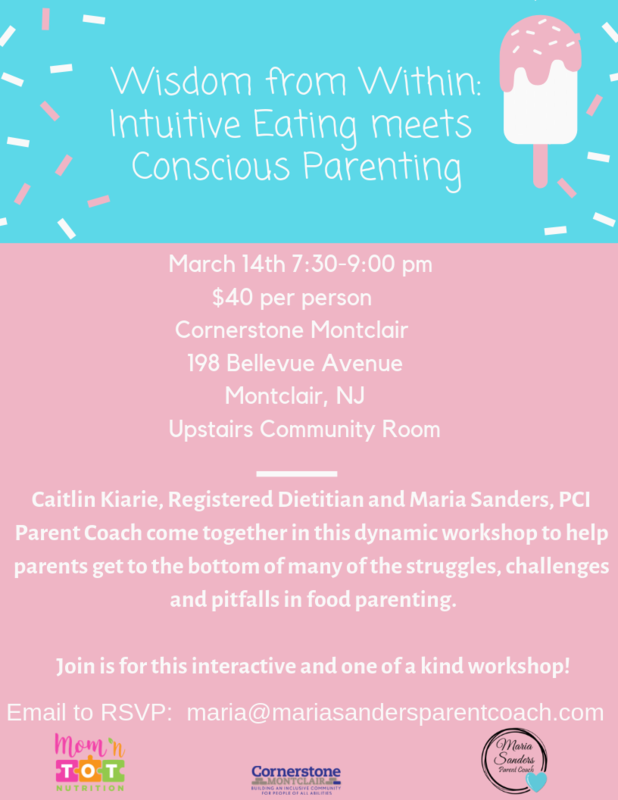 Enjoy lunch on us and understand the concept of conscious parenting, learn and discover the components of being a conscious parent, and create a more fulfilling parent-child relationship. Click here to let us know you'll be there. Maria Sanders is a Licensed Social Worker and PCI Certified Parent Coach®. Maria Sanders has a private practice in Montclair as well as a virtual practice. She works with parents who are struggling with parenting. Parents meet privately with Maria to clarify needs, learn new skills, create a plan and take action steps to reach goals. Research and information is shared to help parents improve communication, alleviate power struggles, and enhance daily interactions. Maria’s goal is to guide, empower, and be a resource for parents and educators.